Even more wonderful is the fact that BTS not only broke the previous record of 56.7 million views, set by Blackpink's "Kill This Love" just last week, but that they smashed it by nearly 22 million views. The world is finally standing up and taking note of BTS, and their new album Map of the Soul: Persona is likely to break records everywhere. The record was previously held by Ariana Grande's popular break-up track "Thank U, Next" with 55.4 million views amassed in the first 24 hours. YouTube Music took to its official Twitter handle on Sunday morning to confirm this mind-numbing achievement, declaring 'Boy with Luv' music video to have indeed become the most watched 24-hour debut. The hype ramped up on Wednesday, when "SNL" released its weekly promo centered on BTS' appearance, featuring Emma Stone as one of the group's "super fans". The video was released on Friday (April 12). 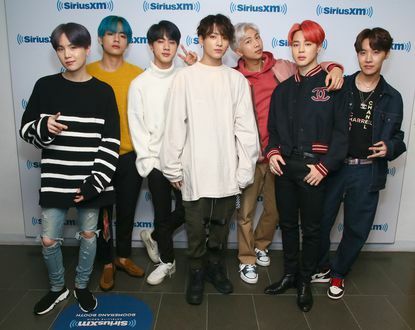 BTS made history on Saturday night, becoming the first K-pop group to perform as a musical guest on "Saturday Night Live". Kadri laid the vicious cross-check after DeBrusk hit Leafs veteran Patrick Marleau into the curved glass at the end of the bench. Toronto Maple Leafs forward Nazem Kadri has officially been suspended for the remainder of the first round of the playoffs.